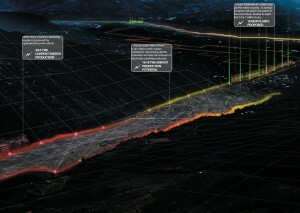 Hydropotential provides a visual map of a country’s forgotten resource, activating public space. Albania is the benefactor of a “geologic impossibility”, where most major rivers originating from its mountains drain directly westward to the sea, cutting through ridges instead of draining around them. Nearly all rainfall that enters the country drains to the sea without leaving its borders, through quick and unnavigable channels. 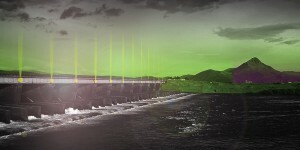 Albania is capable of producing enough hydroelectric power for domestic energy usage, but mismanagement has led to interior shortages and failed export ventures. 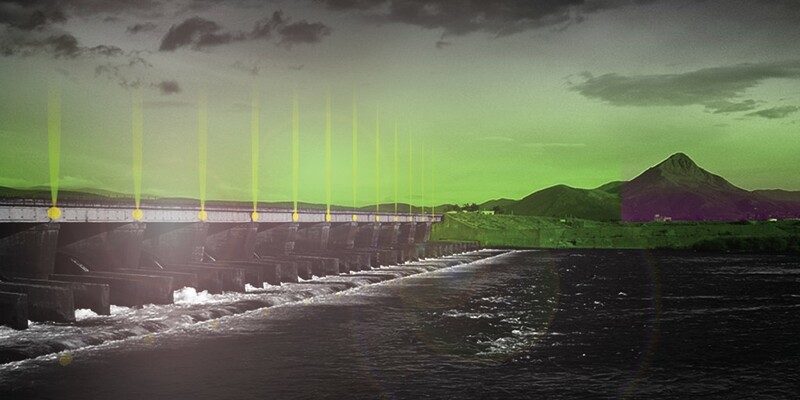 By installing velocity sensors at intervals along the rivers, visual data feedback can be relayed to a system of low-cost LED lighting, visibly earmarking areas of interest for the installation of next-generation hydroelectric generators. Responsive lighting at stations and along the riverbanks indicates changes in measured indices, correlating infrastructural necessity with urban events. The dynamic date collection can be tracked by investors for its potentials and pitfalls to identify areas for development, conservation, and rehabilitation.